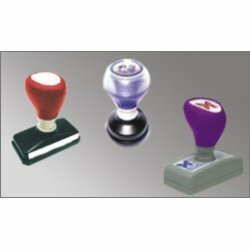 Prominent & Leading Manufacturer from Vadodara, we offer pre ink stamp. We have a wide variety of high Quality ink for usage in Pre Ink Stamp for your Business & Personal use. Our special inks for Pre-ink Stamps, Self Ink Stamps, Nylon Stamps, Date Stamps, Number Stamps, Common Seals (Embossing Seal) and all accessories of Rubber Stamps are very widely used in Industry. We are offering our valuble services online also and now you can give order through our website any where from India. These self inking type stamp inks are used in different types of Self-Ink / Pre-Inked Rubber Stamps that can cast thousands of impressions without reink. These are the easiest to use, giving clean sharp prints the first time and every time. The ink is contained within the die and will give you several thousand impressions (without the use of a separate pad) and after many months ( or even after a few years) when the stamp starts to fade you can bring it back to life by applying a few drops of re-inking fluid. We manufacture the Perma-stamp ink ( also know as FLASH INK) and is available in black, red, blue, green and violet. The bold stamp ink colors and speedy self inking action make Flash stamps and stamp ink ideal for frequent office use. Looking for Pre Ink Stamp ?